Many of you know that I teach on Mondays at the local senior center in Beverly Hills. The ages and abilities of the stamping group is varied. I have one lady who is almost blind, another with kidney failure and many others who are advanced stampers. This weekly event always offers me a challenge to meet the needs and abilities of each and everyone of them. Also the ages very by 30 plus years. The above card will be done tomorrow by the group. A few requested a Father's Day card while others had no use for one. Although the card is simple it will work for birthdays, Father's Day or possibly a sympathy card. 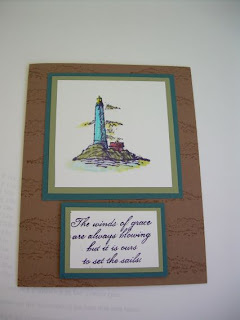 The Winds of Grace set I used is on page 102 of the current catalog. If you often need a male card you might want to add this set to your collection.